There are only a few direct causes of piriformis pain, but many reasons why these circumstances might occur. Piriformis syndrome remains a controversial diagnosis, particularly in the traditional medical sector. Some outspoken physicians claim that the condition does not exist at all, despite large amounts of evidence to the contrary. However, healthcare providers from all backgrounds do agree that many cases of piriformis-related pain are misdiagnosed. The piriformis muscle seems like such as innocent and unlikely suspect in cases of debilitating chronic pain. However, we will provide all the latest research that proves how the muscle can be involved in enacting potentially severe symptoms that can mirror sciatica in many ways, as well as creating other alternative symptomatic expressions. This resource section delves into the causes of piriformis syndrome. We will examine the mechanisms of action through which the piriformis can elicit pain, but also explore the reasons why these mechanisms occur due to various causative scenarios. Injury or pathology can affect the piriformis itself, causing soft tissue pain that might last for several days to several weeks. This is not piriformis syndrome, but rather some variety of muscular strain or trauma. The piriformis can compress the sciatic nerve, potentially enacting a wide range of symptoms often referred as sciatica. Technically, the symptom set should be called pseudosciatica, since it is not created by compression of the lumbar nerve roots from L4 to S3, which is the true scientific definition of sciatica. The piriformis muscle can compress the pudendal nerve, potentially causing a range of pelvic and groin symptoms, as well as incontinence and sexual dysfunction. Demonstrating the sciatic nerve through piriformis muscle (17% of people) might dispose patients towards the development of piriformis syndrome. Piriformis pain from injury can create symptoms from the mechanisms of action detailed above. Luckily, direct injury to the piriformis is rare, but can be created by some strenuous activities and repetitive strain conditions. Piriformis pain sitting usually is exacerbated by hard surfaces, edge-sitting or sitting on a wallet or other item in a back pocket of clothing. Piriformis pain standing is a common symptomatic complaint usually caused by tightness of the muscles and possible interactions with the sciatic nerve. Piriformis disability is a very rare occurrence. Most cases of piriformis syndrome are not disabling, although they do have the potential to become so in very rare instances. Piriformis pain in the elderly is one of the most uncommon of all age demographics. Most piriformis syndrome is diagnosed in younger people. Piriformis pain in children is possible, since children are still prone to being affected by all the potential mechanisms of action that might elicit piriformis symptoms. Obesity and piriformis pain are known to have a miserable relationship. Overweight people have a much higher incidence of piriformis pain (and chronic pain, in general), as well as more severe symptoms. Pregnancy piriformis pain occurs in a minority of women and might possibly endure after the birth. Piriformis pain in certain positions is an incredibly common patient complaint. Most patients will report that some positions provide therapeutic relief, while others exacerbate pain. Piriformis pain in a wheelchair is a burden for some people who are limited in physical function, but still maintain sensory functionality in the lower body. Fibromyalgia and piriformis syndrome are often found together and both are highly controversial diagnoses. Short leg piriformis pain can be related to leg length differentials of structural or functional varieties. Piriformis pain in athletes is the most common type, as more athletes are diagnosed than any other patient demographic. Piriformis muscle imbalance might occur due to over-laxity or over-tension in the piriformis due to a mismatch of ability between the antagonistic pairings that move the hip. Piriformis hypertrophy describes atypical inflammation or growth of the muscular tissue. Pronated foot piriformis pain might make flat-footed patients more susceptible to piriformis syndrome. 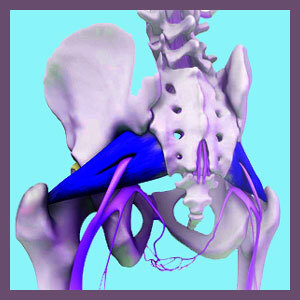 Piriformis pain from the sacroiliac joint is a common misdiagnosed verdict. The sacroiliac can produce pain that is strikingly similar to true piriformis syndromes, as can spinal pathologies also. Although the reasons why the piriformis muscle might create pain vary, the mechanisms through which they act are limited, helping to insure diagnostic accuracy for caregivers who are familiar with these various causative processes. We always recommend seeking out more than one professional opinion on any piriformis diagnosis, since misdiagnosis is a rather common occurrence. Successful treatment for any particular causation relies heavily on identifying both the mechanism of action for pain, as well as why that a mechanism is occurring. Be certain that our care provider can address both of these issues before beginning treatment for optimal therapeutic results. Some causes of pain respond better than others, but our proven pain relief program will provide benefits for all. Remember, our program is the only one that works in 3 tiers to prevent, manage and cure pain, providing rewards for all patients.